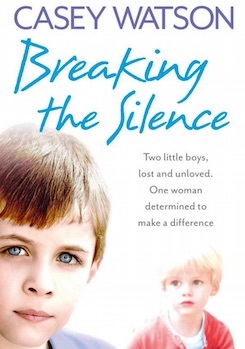 Andrew Lownie Literary Agency :: Book :: Breaking the Silence: Two little boys, lost and unloved. One foster carer determined to make a difference. The Watsons are astonished when they answer their front door to find John Fulshaw, a woman and a small boy on the doorstep. They’ve been fostering for a while now, and this is a first. John has never once turned up unannounced on the doorstep, with or without a child in tow. Casey is even more astonished when she finds out why. Jenson, 9, was removed from his home only 30 minutes earlier. It transpires that Jensen and his thirteen year old sister have been left ‘home alone’ while their mum’s gone on a fortnight’s holiday with her new boyfriend. She apparently left them with plenty of food and some money, telling them that they must go to school every day and stay in the house in the evenings. Three days into this, however, a neighbour alerted the police when the thirteen year old decided to throw a house party. The sister has already been placed with a couple earlier this morning, and John wonders whether Casey and Mike will take Jenson. It’s not their usual remit, but they are happy to do so - though he’s rebellious, full of attitude and a challenge from day one, where else is the poor boy to go? And, anyway, they expect his stay to be a brief one. The social worker has told them that the mother will probably be arrested when she returns and then a judge will decide the family’s fate. When John phones a couple of week later, Casey assumes he must be calling to tell her he has news of Jenson’s mother – now home and having been charged - and perhaps that Jensen is going to be allowed home. But she’s in for her second shock. He’s actually phoning to ask her if she and Mike would consider taking a second child. It’s another first: she had a pair of young siblings a couple of years ago, but two unrelated boys with different problems and needs would be another thing entirely. But when John explains about the other boy, who’s also 9 and is called Georgie, she feels any misgivings melt away. Georgie is autistic and has been in a children’s home since he was a toddler, his young unmarried mother being unable to cope with his complicated needs. Social services have been looking for a family to adopt him for some time. But now that need has become urgent as the children’s home is closing, and while they search they need a loving temporary home for him.